The defining example of “pesky” in the dictionary is the notorious mosquito. 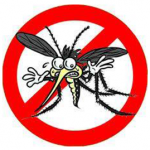 According to the American Mosquito Control Association, mosquitos cause more human suffering than any other organism and more than one million people worldwide die of mosquito-borne diseases each year. Millions more animals die each year from heartworms and other mosquito-related illnesses. Treat ornamental pools and ponds with larvacides or stock with predacious minnows. Arrange tarps covering items to drain water after rainfall. Dispose of water-collection containers, or place lid over them when it is not raining. Change water in birdbaths every few days. Clean debris from gutters, flat rooftops, and around sheds or AC units where moisture can accumulate. If there is a ditch or easement behind your house, you may need to treat tall grasses and standing water with pesticides to ensure that mosquitos are not breeding.